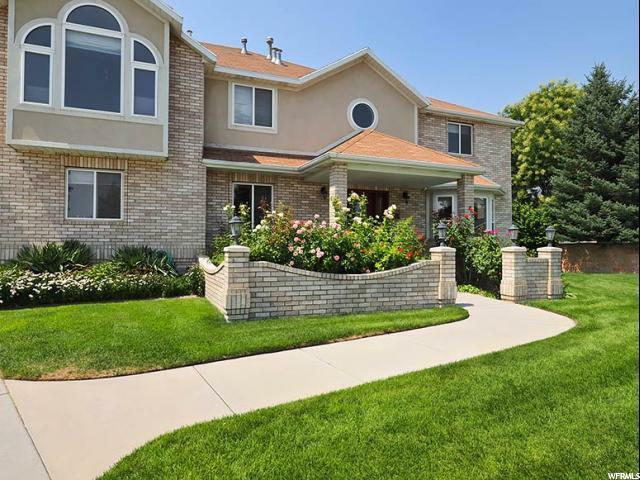 Don't miss out on this lovely South Jordan two story situated on a beautiful .69 acre, quiet cul-de-sac lot covered with mature shade trees and surrounded by an all brick fence. In addition to the spacious 7 bedroom interior, this home features a three car double deep garage with an epoxy finished floor that will house 6 cars and a few additional toys to boot. If that isn't enough space to house all your toys there is also RV parking on the side of the garage. Along with the lovely landscaped park like yard there is an adjacent garden area that is the home for mature apricot, pear, peach, plum, and apple trees. All the work is done for you. Just sit back and enjoy the beautiful setting. You can enter the fully finished basement with 3 bedrooms, a family room and a kitchen from the walk up inside the garage as well as through the home. Prepare your meals for your family or guests on the spacious granite kitchen counter tops and serve them at the bar with attached bar stools or in the formal dinning room adjacent to the kitchen. Square footage figures are provided as a courtesy estimate only and were obtained from county records . Buyer is advised to obtain an independent measurement.